How to use chopsticks like a pro! 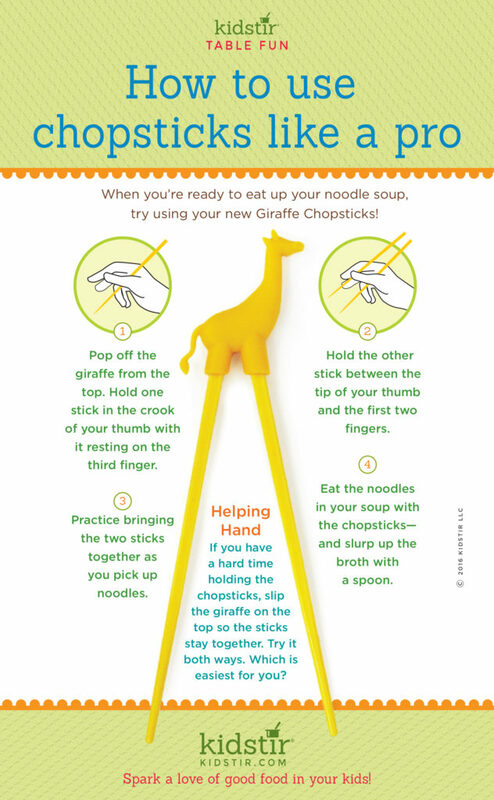 When you’re ready to eat up your noodle soup, try using your new giraffe chopsticks. Pop off the giraffe from the top. Hold one stick in the crook of your thumb with it resting on the third finger. Hold the other stick between your thumb and the first two fingers. Practice bringing the two sticks together as you pick up noodles. Helping Hand – if you have a hard time holding the chopsticks, slip the giraffe on the top so the sticks stay together. Try it both ways. Which is easiest for you? We’d love to offer the Kids Using Chopsticks Infographic for you to share on your blog. Just select and copy the code snippet below and paste into your next blog post. We’d love for everyone to share this page on social media or email using the buttons below so all the kids you know can learn how to use Chopsticks like a pro!